In the American tradition, green tomatoes are at best fried, and at worse composted. But this ignores their potential. Tomatoes are fruit, after all, and unripe or not can be made into preserves. Unripe green tomatoes lack the foxy flavor of their mature counterparts but do have a brisk acidity and a vegetal quality that plays nicely as a jam. This preserve is simple but can be a real eye-opener. It, of course, works well with cheese, as nearly all fruit preserves do, but runs just savory enough that it could be used as a condiment like chutney. The fruit is the star here, in all its unsweet glory. 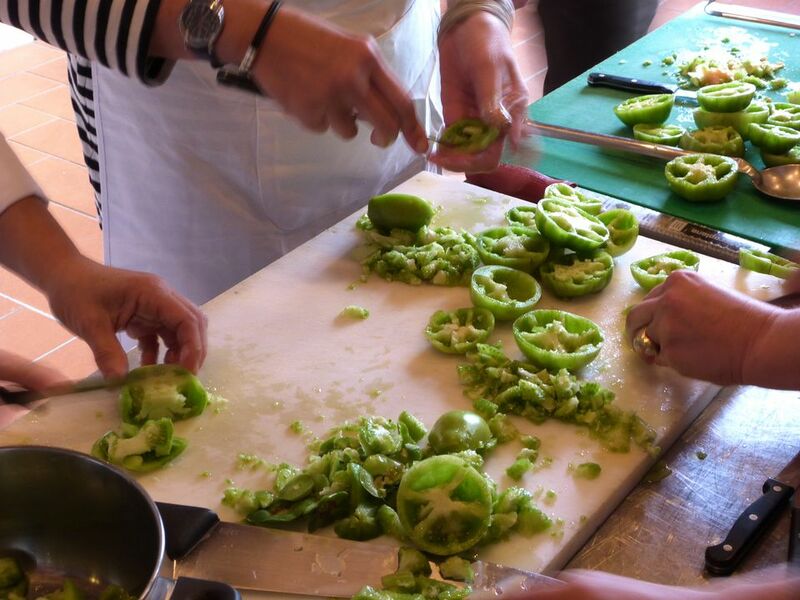 This recipe comes from Marzia Brigante, who teaches preserving classes in Emilia-Romagna. She has also provided recipes for a simple yet elegant lemon marmalade, Abate pear conserve with lemon and walnut, and the traditional Romagnolo conserve called savòr. Wash the green tomatoes, and pat dry. Remove the core. Chop the tomatoes into small pieces, removing the seeds. Place the tomato pieces in a large, nonreactive pot with a heavy bottom. Zest the lemon, and keep the zest refrigerated in a small bowl with a small amount of lemon juice to keep it hydrated. Add the sugar and juice of half the lemon. Toss, and leave in the refrigerator, covered, to macerate overnight. The next morning, the tomato should have given off a fair amount of liquid. Place the pot over medium-high heat, and bring to a boil, stirring occasionally to avoid scorching. Lower the heat to a low boil, and cook for about an hour, again stirring occasionally. When the mixture pulls away from the pan when stirred, remove from the heat. Add the lemon zest. With an immersion blender, purée the mixture thoroughly. Alternatively, use a regular blender, working in batches. Pour the jam into clean jars, and allow to cool to room temperature. Seal and store in the refrigerator for up to three weeks, or in the freezer for up to three months. The green tomatoes, in this case, are unripe standard red tomatoes, like beefsteak. While you could use tomatoes that are green when ripe, like Green Zebra, or tomatillos, which are related to tomatoes but different, the result will be different. Because the acidity of tomatoes is highly variable, even when unripe, this recipe is not recommended for water bath canning. Keep this fresh and use quickly, or freeze it for the longer haul.